In the last 55 years, about 2,000 students have graduated from the Lithuanian University of Educational Sciences with a degree in Polish philology. Now, they work as teachers, lectures, journalists, tour guides, translators, workers of local governments and various cultural institutions. Celebrations held to mark the 55th anniversary of Polish Philology in Vilnius have gathered only a part of the numerous community. It was a great occasion to bring back memories and recollect former accomplishments as well as to think about plans for the future. “The world has changed, but memories remained. The special ambience of those bygone times, including lectures, exams, lecturers, parties, relationships and friendships, trips to kolkhozes, is still remembered. Here is where it all began. I am grateful to God, people, fate and circumstances that I was given a chance to study Polish philology and managed to graduate in this place. This experience has undoubtedly enriched my existence. I try to lead my life on the basis of what I have learned here from skilled and knowledgeable people. I also want to recreate it in the life of my family and a community I work for,” said Zdzisław Palewicz, mayor of Šalčininkai District Municipality and a graduate of Polish philology, during the celebration. “In reference to today’s feelings of football spirit, it can be said that we all, both students and lecturers, were a one big family of ‘Czeczot’s Eagles,’. We had a great coach, good squad and it pays off,” he added. Palewicz pointed out that Lithuanian University of Educational Sciences is the most important university and unless politicians understand it, serious problems will arise in the country. “I spent 17 years of my life in the faculty of Polish studies. The first five years as a student, and the following years working at the department of Polish philology. Those were the best years in my whole life, not because I was young, but because I met many wonderful people there,” said Ludmiła Siekacka, an expert teacher of Polish from Adam Mickiewicz Gymnasium in Vilnius. Polish philology at Lithuanian University of Educational Sciences, as well as the university itself, has undergone restructuring. Changes involved departments, authorities and even names. Although, it has always been one of the most vital focal points of Polishness in Lithuania since it was educating future teachers of Polish schools. They were not only teachers of Polish language and literature but also history, geography, biology, and primary school teachers. Young Poles from Russia and Ukraine were also educated in Vilnius. All of the graduates mentioned an amazing university staff i.e. an unforgettable long-time dean of the Department of Polish Philology Włodzimierz Czeczot who used to treat each student with a fatherly patience. Another important figure, who was mentioned, was Genadiusz Rakitski, professor of the Faculty of Polish Language. 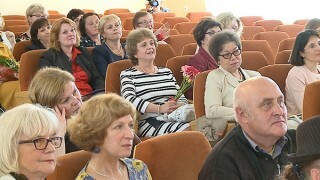 Also names of several lecturers were brought up, namely those of Anna Kaupuż, Margarita Lemberg, Irina Kaszkarowa, Helena Gustin, and Maria Niedźwiecka. A laboratory assistant, Franciszka Tyszkiewicz, diminutively called by students ‘Mrs Frania’. Dean Czeczot was a ‘father’ of the students of Polish philology, whereas Mrs Frania was its caring ‘mother’. Currently the Centre of Polish Language, Culture and Didactics is lead by their former students. “We are aware that it is not easy to live up to the standards set by our predecessors, yet we have great role models we can look up to. We were lucky to begin our work under their watchful eyes. We do not compete against them but we endeavor to reach their intellectual level, level of bonds with students. That is why we still try to develop our skills,” said dr Henryka Sokołowska the director of the Centre of Polish Language, Culture and Didactics. All workers of the centre have academic titles, conduct research, release books, and attend academic conferences. In its best times, Polish philology used to enjoy immense popularity among students. One applicant out of at least three others was accepted to the university. Each year only the best 15 applicants plus additionally two or three people as unenrolled students were accepted as regards full time studies. Quite a similar number of students regarded extramural studies. A major breakthrough happened after 2008 when it was announced that if one wants to study, one has to pay for it. The number of students began to decrease at that time. In 2013 MA studies were no longer available for students. Currently, the system of higher education in Lithuania offers students BA studies lasting 4 years. Graduates obtain a Bachelor degree in Polish philology and in pedagogy as well as vocational qualifications entitling to become a teacher. The average cost of studying Polish philology at the Lithuanian University of Educational Sciences is about 1.000 EUR per semester which makes it rather expensive. Embassy of the Republic of Poland seem to support the university as, since 2013, it has been funding studies for those students who were accepted on studies that require fees. Polish teachers-to-be are also supported by the Pedagogical University of Cracow. “I not only believe, but I’m sure that the 60th anniversary of Polish philology will be a chance for the Association of Poles in Lithuania to fund a scholarship. The Electoral Action of Poles in Lithuania could fund a second scholarship. The Association of Polish Scientists in Lithuania might offer a third one, whereas the last one could be proposed by the Polish fraction in parliament,” suggested half-jokingly Anna Adamowicz, a lecturer at the Vilnius School of Technology, Business and Agriculture, a Polish philology graduate and a famous story-teller. It appears that future of Polish philology depends on a collective effort. “Overall, we need a change of an attitude of state powers towards teachers and school in general. Only then young people will choose to study Polish philology and pedagogy. What we, as politics and community workers, can do is to promote Polish language and Polish philology by supporting and helping to educate a new generation,” added Zdzisław Palewicz. Tłumaczenie by Karolina Wojdat	w ramach praktyk w Europejskiej Fundacji Praw Człowieka, www.efhr.eu. Translated by Karolina Wojdat	within the framework of a traineeship programme of the European Foundation of Human Rights, www.efhr.eu.